John Caird’s production of Love’s Labour’s Lost, at the Stratford Festival, is filled with wonder, mischief and magic. Forget the plot. There isn’t much to speak of—and not a whole lot of character development either. The play, at its best, is a celebration of love and a satire on the fragility of the human spirit. In an atmosphere reminiscent of the sacred forest in Midsummer Night’s Dream, the clown-like antics of scholars, huntresses and wandering pilgrims collide in a kaleidoscope of mistaken identities, mismatched love letters, feigned vows of chastity and bumbling romantic adventures. The actors had fun. They were energized. They bounced words off one another like kids jumping on trampolines. It didn’t matter that the words didn’t make much sense—only that they were said so passionately. Mike Shara is magic every time he appears—no matter what role he undertakes. In this comedy, as ‘Berowne’, a young man who forsakes his vow of chastity to secretly woo a woman – his energy and passion drove the whole production. Brad Ruby, as Dull, also lit up the stage every time he appeared, with his comical facial expressions, gestures and movements—rooting and grounding the action around him. Tom Rooney, as Holofernes, did the best job of capturing the subtle nuances of Shakespeare’s puns and innuendos, while Juan Chioran as Don Adriano de Armado, kept the audience laughing with his comedic delivery. 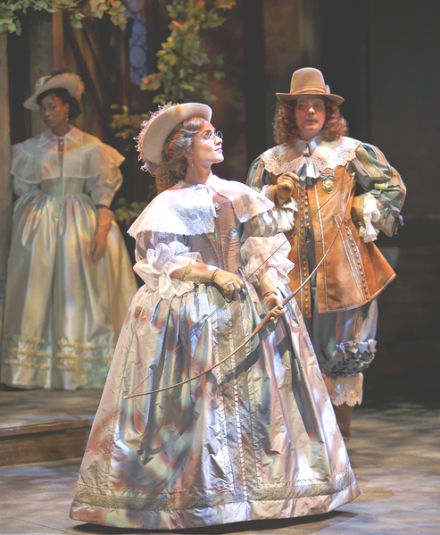 Best female performance: Ruby Joy as the Princess of France – fostering a sense of gentility and grace. It is easy to see that director, Caird, worked on the original production of Les Misérables in London. This play is directed like an opera- albeit without the booming soprano. Music emerges from every corner. Trumpet, trombone and French horn players creep down the aisles and appear at the edges of the stage. Having a brass instrument blown in the audiences’ ears becomes, not an intrusion, but an invitation; to join in the festive fun. This is the way it must have been in Shakespeare’s day, when pageantry appeared on every street corner. Adding to the mood was Michael Walton’s exquisite lighting, creating, at times, a pre-Christmas fairy land, with coloured sparkles glittering in a gigantic tree. Patrick Clark’s elaborate costumes and set – an outdoor patio resembling a ball room – contributed to the party ambiance. Watching this production felt like participating in a night at the improv. Perhaps, that’s the way Shakespeare intended it. Love’s Labour’s Lost is playing at the Festival Theatre at the Stratford Festival until October 9th.